Legend Nicky Chinn will be playing for Cardiff aged 45. The Petereborough Telegraph’s club by club guide to the 2017-18 EIHL season. Imports: Tomas Karpov (Czech forward), Jaroslav Cesky (Czech forward). The Bison are always a force in the EPL and that won’t change in the NIHL. Tom Carlon should star for MK Thunder. They have a solid netminder, they will have the same gritty approach as ever and they have some big attacking weapons, especially Karpov. They will be title contenders for sure. Imports: Frantisek Bakrlik (Czech forward), Jan Bendik (Czech defenceman). The Bees probably boast the stand-out player in the league in Bakrlik, who is back after helping MK Lightning to glory in the EPL last term. Imports: Tamas Elias (Hungarian forward), Robert Sedlak (Slovakian forward). Promoted after back-to-back titles at the level below, the Fire have signed a legend in 45 year-old Nicky Chinn and probably have the toughest player at this level too in renowned MMA fighter Bradley Watchorn. They should be good to watch and will win plenty of games. Imports: Ondrej Zosiak (Slovakian defenceman), Adam Rehak (Czech forward). The Dynamos could well be the best of the teams already playing in the NIHL, despite losing their first two games last weekend. They finished second in Division One South and won the play-offs last season. They have former Phantoms goalie Damien King between the pipes. Easton guided Chelmsford to the last two of their five successive NIHL Division One South titles from 2012/13 to 2016/17 – and the prolific Huska starred in both of those successes. Roster includes Phantoms’ treble-winner Andy Munroe as well as local netminder Euan King (brother of Damien). Another team to keep it British and they will certainly still be able to hold their own. Tom Carlon should pile up points after starring for MK Lightning in the EPL. Defenceman Lewis Christie was also part of that side and Rupert Quiney is a big blue-line signing who looks certain to impress. Can’t see them challemging for honours. 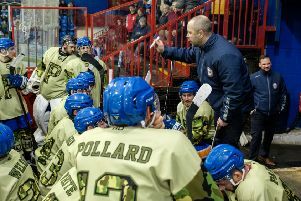 Phantoms have retained a lot of fine players, including two high-class imports, added some shrewd signings and still boast the best coach outside the Elite League. They’re certain challengers for trophies and many expect them to end the season in possession of some silverware. Entertainment is guaranteed. No overseas signings, but some very good Brits including ex-MK Lightning stars Michael Farn and Adam Carr, and the always dangerous Ryan Watt. Third at this level last season, but it’s a different proposition now and they will probably find the going very tough against teams like Phantoms. Swindon are thought to have the biggest budget and certainly boast one of the best rosters in the league. The Wildcats will be on the prowl for honours, but have frequently come up short at EPL level and that may happen again. Lost to Phantoms twice in challenge matches last weekend.